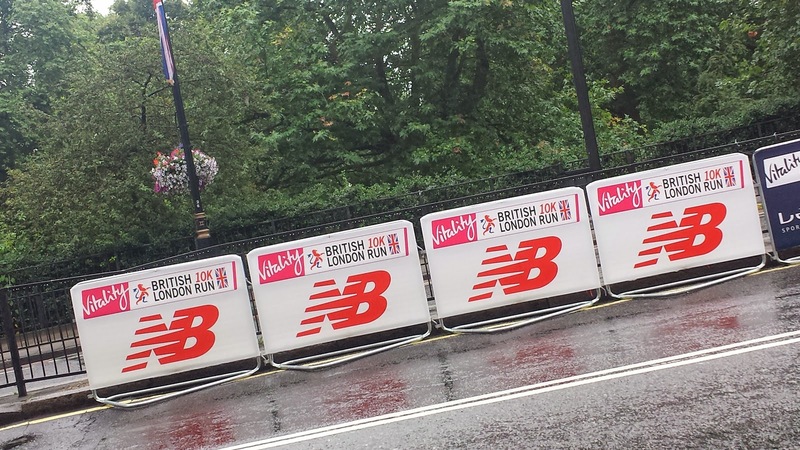 If you have read my previous race blogs, you may have noticed that I usually tend to stick to smaller, local events. 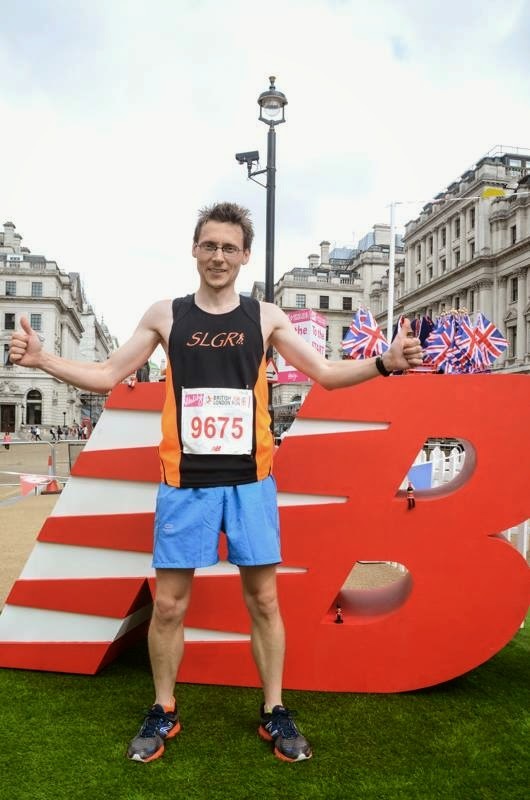 However, when the opportunity presented itself to run the British 10k as a guest of New Balance - who were the official sports brand partner - I just couldn't resist. 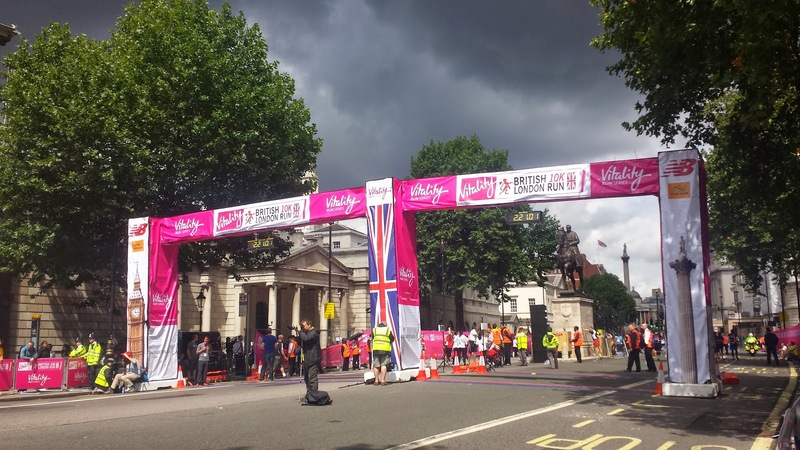 This year the British 10k became part of the Vitality Run Series. With my entry confirmed way back in January, I had a long wait until I received my race pack, which arrived about 10 days before the race. It contained my race bib with inbuilt timing chip, some safety pins, the official programme and my commemorative tech t-shirt. On my original entry form, I had asked for a small t-shirt. However, the t-shirt that arrived was a medium and swamped me. I attempted to have it exchanged but sadly it wasn't possible. I was also given a free subscription to runcoach to help prepare me for the race, but after signing up I didn't use it because I have been following an anti-plan method of training for the last year which has been very successful for me. The runcoach plan wanted me to do certain workouts on certain days and I just couldn't make it ft in with my haphazard (lacking any obvious principle of organisation) style of training. For most people who actually train properly, I imagine it would be a very useful training tool. 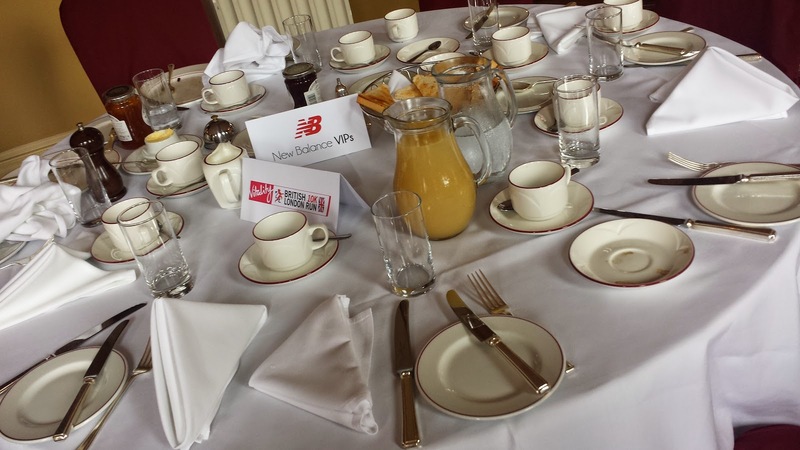 As I was a guest of New Balance, they had arranged a special pre-race breakfast at the Cavalry and Guards Club. I arrived at 8am kitted out in my black and orange 'So Let's Go Running' club vest and was issued with a VIP guest pass. I proceeded up to the main breakfast dining room where I was escorted to my table. It was here that I met some journalists from a newspaper (but I can't quite remember which one) and also fellow blogger, Ian, who writes the 'running ok in the uk' blog. I also bumped into Adele, who writes the 'fitartist' blog. Both of their reports (Ian's / Adele's) from the day are a great read and definitely worth checking out. Before the race started, there were some speeches, songs from the Military Wives Choir and poems to link in with the theme of this year's event which was the 100th anniversary of the start of the First World War. And in keeping with this theme, the official charity of the event was Help for Heroes. The speeches, songs and poems all took place from the balcony of the of the Cavalry and Guards Club and I was fortunate enough to be able to stand with them on the balcony during the formalities (I even spotted myself on one of the big screens). Another bonus of being based within the building was that I didn't have to queue to use the portaloos, I got to use the lovely, fancy-pants toilets in the club. An additional perk of being a special guest was that I wouldn't have to join the mass of runners queuing for the start along Piccadilly. So when it was time to get in position to run, I was simply allowed to join the first wave of runners. I filtered through to the front, where I found a line of marshals separating the first wave of mass runners from the elite. Upon leaving the club, New Balance had also issued me with an 'Elite Athlete' pass, so I was allowed to go through the line of marshals and start right at the very front with the proper elite runners. After a brief downpour of rain and a rendition of the national anthem, the race got underway at 9.35am sharp (video of the start). I headed out at fair old pace along Piccadilly (starting with elites has that effect) and ran past all the runners that were waiting patiently for their turn to start. I kept my eyes peeled for any runners I knew, and to my surprise, in one of the waves of runners queuing on the opposite side of the road, I saw a fellow runner from Dartford, Ben, he called out my name and we managed a high-five as I passed. I had chosen to wear my New Balance 1080v3 road shoes - they are still my favourite road shoe and they did a wonderful job, as always. The race then passed The Ritz and then took a right hand turn and headed slightly downhill along St. James's Street towards St. James's Palace before turning along Pall Mall where I'm sure I heard someone in the crowd say 'oh, that was that buggy runner guy' as I passed - that gave me a nice boost and made me smile as I ran through Trafalgar Square and then reached the 2 kilometre point. I was still running at a pace way faster than I could maintain for 10k. The route then continued down towards the river, where I turned left onto Victoria Embankment and ran past Embankment Station to the cheers of the thousands of people that had come out to watch and support the runners. I really was amazed to see so many people out this early on a Sunday morning. I'm not used to having so much support and I felt a bit guilty for not being able to acknowledge every single person that cheered me on. As I reached Somerset House, I made the very conscious decision to drop the pace a little (by about 10 seconds per km) because I had covered the first 3 kilometres at a faster pace than my current 5k personal best pace. Not the greatest plan for a 10k race. This part of the course was quieter and not so pleasing on the eye as the other parts, as it passes through the 1960s concrete of the Blackfriars underpass and surrounding buildings. A 180 degree turn just before reaching Southwark Bridge marked the most easterly point of the course, before sending the runners back through another section of underpass and up on a strange loop where the halfway point is found. My official halfway (5k) time was 18:36, which is only a few seconds off my current 5k personal best. Thankfully I was now maintaining the slightly slower pace (more or less in line with my proper 10k pace). I looped around and rejoined Victoria Embankment where I now headed west. It was at this point that I finally got to see the rest of the runners again. I even heard someone shout 'So Let's Go Running' during this section - so I raised a hand to acknowledge her. The weather conditions were a little on the humid side and I was starting to feel it. As I reached Embankment Station again, the crowds gave me an incredible boost, especially as I passed under the train line into Charing Cross station - the noise was deafening (in a good way) at this point. A couple of children held their hands out for a high five around here, and I happily obliged. I continued on with the London Eye to my left and eventually the sight of the Elizabeth Tower (Big Ben) came into view. When reaching the end of Victoria Embankment, the course turned left and went over Westminster Bridge where, on the other side, there was a double decker routemaster bus parked in the middle of the road for the runners to loop around. Coming back across the bridge, I spotted my wife with the camera, gave her a quick wave and continued to focus on the last two kilometres of the race. I had spent most of the race a few seconds behind the eventual winning female runner, and I did start to gain on her slightly at this point. Next I ran clockwise around half of Parliament Square, past St. Margaret's church and Westminster Abbey, and headed off for an out-and-back section on Victoria Street with the turnaround point outside New Scotland Yard. This section was mentally tough, mostly, I think, due to the fact that you are running away from the finish line when you are approaching the point of exhaustion. After turning around, it was a case of returning to Parliament Square, continuing the clockwise loop and finally onto Whitehall for the last 300 metres, which included passing the Cenotaph and Downing Street before reaching the finishing line, which is almost on the exact spot of the execution of Charles the 1st, outside Banqueting House. I couldn't quite catch the first finishing female in the end, but that didn't matter because I had just run my fastest ever 10 kilometre race. At this point I didn't know my exact finishing time because I forgot to stop my stopwatch as I crossed the line and of course I wasn't paying attention to the big clock right in front of me. My time wouldn't be confirmed until later in the day when the results had appeared online, but I knew it was somewhere around 39 minutes and I was hopeful that it would be sub-39. Once over the line, a marshal gave me a bottle of water and I continued to walk along Whitehall towards Trafalgar Square. Being such a large event, the post race arrangements felt quite odd and spaced out to me. I knew I had to continue walking onto The Mall and then up to Waterloo Place towards the baggage areas. However, it wasn't particularly clear what the medal-collection process would be. Once up at Waterloo Place, it became apparent that the medals were being given out by the staff that were manning the baggage areas. During my time in this area so many people came up to me to ask where they could get their medal. 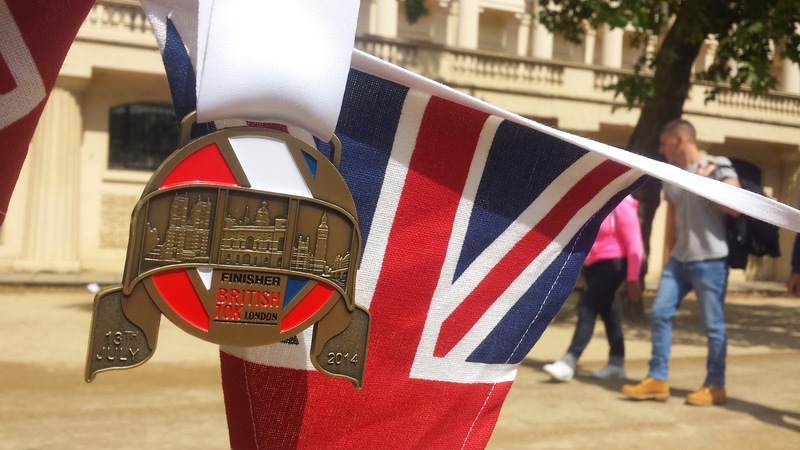 For the record, the medal was pretty decent - it was a bespoke design showing some of the iconic landmarks and had the date of the race etched onto it (there's a photo of it further down this page). The other reason for going to Waterloo Place was to meet up with the lovely people from New Balance again, and to visit the New Balance Village. Here there was a New Balance stand where runners could pick up special deals on clothing and other bits and pieces, and check out shoes at the Sweatshop pop-up store. There was also a garden area with mini golf and free popcorn. Shortly after arriving, the day's musical entertainment began - the performance was by The Rinky Dinks - The UK's first ukulele supergroup! After picking up an extensive collection of swag, including shoe laces, t-shirts, NB water bottle, shoe fresheners, drawstring bag from Tiger Balm and other assorted goodies, I joined the queue for a free massage provided by YourPhysioPlan.com . It was a pretty full-on (painful) experience and it really sorted out my sore calves, which were very knotty. After a brief discussion about my race times and frequency of running, the advice was to have someone look after my legs on a more regular basis, so I may be on the lookout for a physio with an equally firm pair of hands in the near future. I spent some time wandering around looking for people that I knew, but there were so many runners milling around that I gave up and headed off home. Once there, I went online to try to find out my official finishing time. The official British 10k results page was still displaying 2013's results but I managed to find this year's results straight away by going straight to the webpage of the official chip timing company - TDL event services. If you are interested in my GPS data you can view it on Strava. The app brought the course out slightly long, but when you look at the fact that I passed through two tunnels and the line the satellites picked up weaves all over the road, it's not surprising. I imagine the course was spot on. The total number of runners that completed the course is unclear. 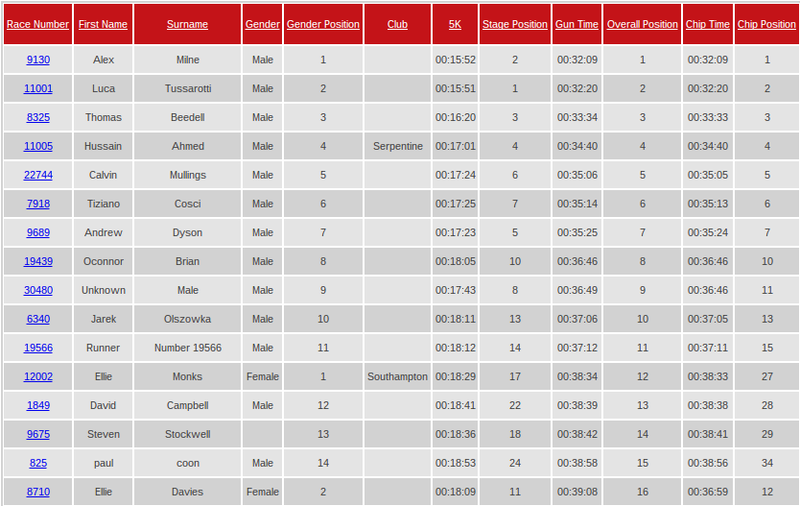 I've read somewhere that there were 19,000 of us, but the official results page only shows 14,298 finishers. This number has changed a few times and I imagine it will change some more after I have published this blog. 5k splits (18.36 and 20.05) - oh dear. Overall, I had an brilliant morning at the event. The route was pretty good, but I think because I run on these streets so often, it felt a little like running one of my training runs, and the landmark buildings didn't wow me in the same way as they might for someone from out-of-town. 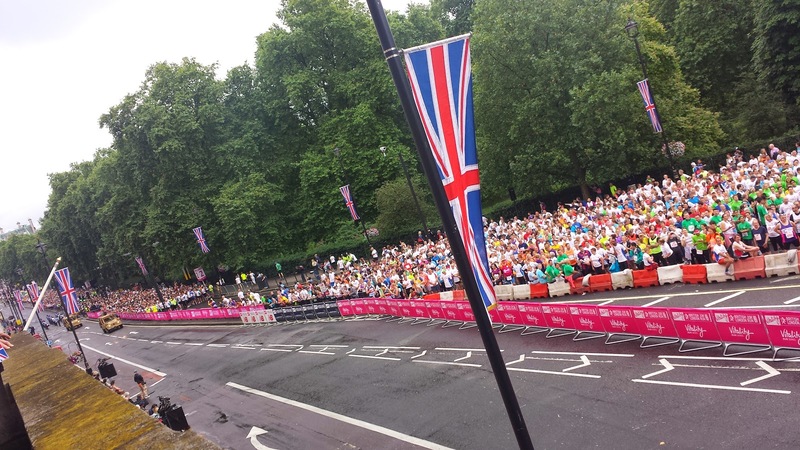 It was, however, the support from the spectators around the course that has really stuck with me - they were amazing. I have a feeling that my experience and finishing time would have been completely different if I had entered in the usual way (with a £50 entry fee) and had started in one of the mass runner waves. The New Balance and Gung Ho staff were absolutely brilliant hosts and I can't thank them enough for giving me such an amazing experience. 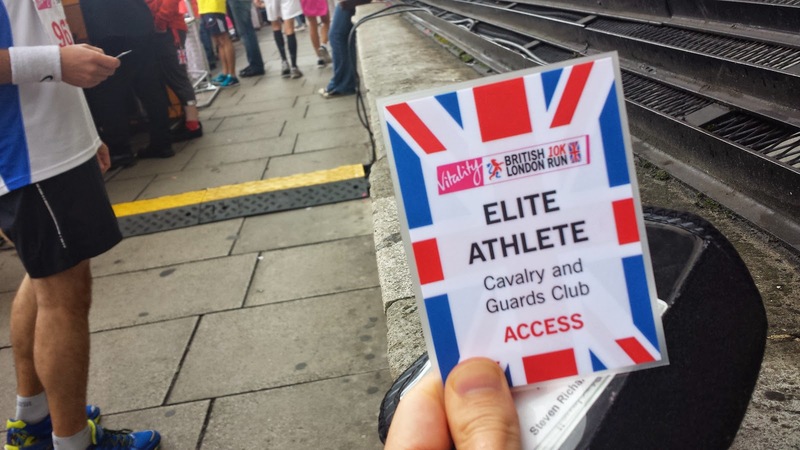 The Elite Athlete pass really was the icing on the cake!